There is at least one terrestrial clean-up strategy that could be applied to space junk: recycling. Among the estimated 4,500 satellites in orbit, only about 1,500 are still functional. But those roughly 3,000 dead satellites contain valuable components that could be repurposed for other uses. Some could be towed to Mars, to assist missions to the red planet, where they could be repaired. Other satellites with valuable building materials could be melted down by a solar-powered orbiting forge. But most of the orbital debris is space-age flotsam and jetsam, such as spent rocket stages, screws and lens caps. There are about 23,000 detectable objects at least 2 to 4 inches in size in low-Earth orbit (the preferred altitude for most satellites and space missions) or about 1 to 3 feet in size in geostationary orbit (the ideal altitude for surveillance and communications satellites). What’s more, these objects can create more pieces of debris when they collide with one another or explode in orbit, due to leftover fuel or battery failures. Around 290 such “fragmentation events” are known to have occurred since 1961, creating an estimated 750,000 objects larger than about 0.5 inches in size. Circling the Earth at speeds around 10 times faster than a bullet, the kinetic energy of even miniscule objects can pack a punch strong enough to puncture the hull of a space station or damage solar panels and communication arrays. As more satellites are launched into space, the probability of collisions grows. There are, however, preventive measures that could mitigate the problem. For instance, engineers are developing technology to facilitate the venting of leftover fuel, thereby averting explosions in orbit. Or, satellites could be equipped with low-tech devices, such as balloons, that would enable Earth-based operators to guide them into the atmosphere – where they would burn up – at the end of their operational lifetimes. Only 13% of Americans, however, have a great deal of confidence that space companies will sufficiently address the debris problem, while 51% have not too much or no confidence, according to a recent Pew Research Center survey. 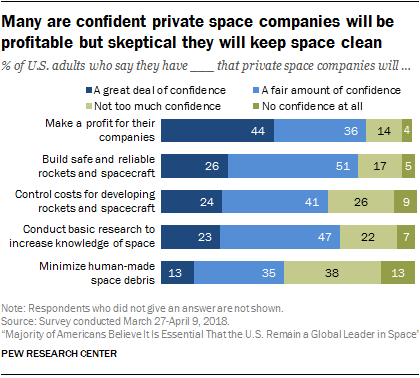 Yet, the same survey finds that, among the 7% of the public that is highly attentive to space news – those who say they have heard “a lot” about NASA in the past year and “a lot” about private space companies – some 37% have a great deal of confidence that private companies will minimize space debris. 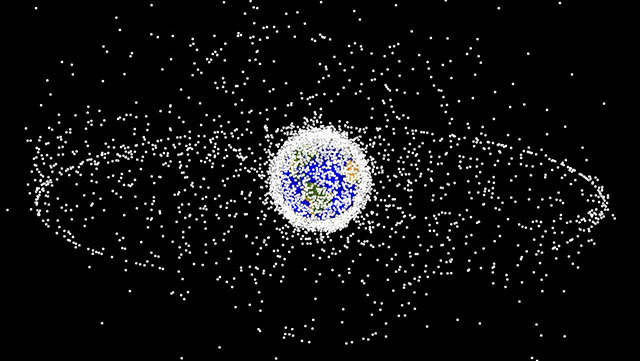 Private companies might, in fact, profit from the growing need to eliminate existing space junk from Earth’s orbit. One recent business study estimates that the global market for monitoring and removing debris will generate $2.9 billion in revenue by 2022. Technology for debris removal is currently being tested at the International Space Station. A satellite built by the British company Surrey Satellite Technology Limited, which is equipped with a harpoon and net, will test a system for capturing large pieces of space junk. At the end of its mission, it will unfurl a drag sail to slow its speed, bringing itself and the captured debris out of orbit, where it will burn up as it enters the atmosphere. No landfill required.